my problem is that X2Pro searches in the original medial folder for the media files, but they are in the transcoded media folder. I edited the xml-file manually and then it worked. In X2Pro I cannot chose the complete path because of the one-folder-final-cut logistic. There is only the one media center folder I can chose. Apologies if I have misunderstood what you are saying. Can you confirm that the path does contain the media. So you are aware, we can only read the paths that the fcpxml contains, therefore if the media does exist then you might need to specifically add this location in media locations in X2Pro preferences. If I checked the path I see that in the original folder of that project are only the alias files. The original files are in the transcoded media folder at the high quality media folder. In X2Pro Audio I can only chose the Extern hard disk where is the FCP-project is on as the media location, not the needed path to the high quality media folder, that is needed, because FCP packed everything in that one project file. So can You give me an advice, how I could handle it? Thank you and best regards from Berlin, Germany! Sorry for the late reply. I have been on holiday. I'm glad I could help you sort out the issue, thank you for letting me know that the problem is solved. If you are happy with the X2Pro product and the support you have received, it would be great if you were able to post a review of X2Pro in the app store. It is done. Thank you SO much. You have been amazingly helpful. Just that one damn file holding everything up. Very much appreciated... you've saved the day my friend! If there is someone or some survey to fill out to sing your praises let me know! Aha, that is definitely the problem then; it's a "broken" alias. If you select your project in FCP and choose File>Relink Files..., does it show up when you have "Missing" selected? If so, you should be able to relink using that window. That window may also show you other files that might be "missing", which would also need to be fixed. It's greyed out for sure. Okay, I found the file, but can't relink it to the pointer b/c it is in the damn fcpbundle. Any thoughts there? I didn't think that option is only available in the pro version. To be clear, I'm taking about the checkbox in the "Media Handling" section of the X2Pro preferences which you can get to from the menu bar or by pressing CMD+, (CMD+comma). If that really is disabled on your version, can you provide the wav file? How big is it if you compress (zip) it? I suppose this is where I'll need to upgrade to Pro, as those options are greyed out. Or is there another thing we can try first? That shouldn't be a problem - it is normal to have original media copied into the fcp library bundle. 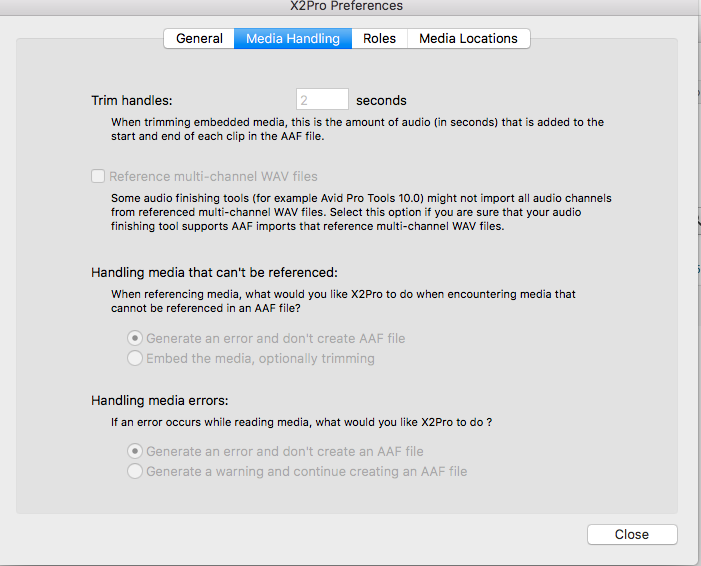 If you change the X2Pro preferences to "Generate a warning and continue creating an AAF file" when "Handling media errors", does that enable you to get past it. If so, does it tell you about any other problematic files, or is it just this one? And it is all in the right place, but Joanne.fcpbundle/ is an FCPX Library, could that be the problem? To access it I need to right click it and do the whole "show contents" to get into it. The file that it is complaining about is one called "S3E-1S_0274.wav", which, according to the fcpxml, should be in "/MASTER A/Project/Joanne.fcpbundle/1. Footage Dailies/Original Media/" on a drive called "Batou". Is that drive plugged in/mounted and if so, is the file in that location on the drive? Yeah, I put a location when prompted the first time. There are audio files in locations that cannot be accessed by X2Pro. Pressing the OK button will show the X2Pro Preferences where you can fix the problem and find more information. So, yes, it prompted me to add locations when I hit the start button. Do you have any media locations listed in X2Pro preferences? If so, can you remove all of them and try again. If that doesn't work please tell us whether the error message is different, and whether it prompted you to add any media locations when you hit the start button. Simply trying to convert a XML file kicked out of a FCPX to aaf.